Moondance has something for everyone! Located on one of the most beautiful and unspoiled beaches on the East Coast you can spend your days doing everything a water sports lover can dream of or you can spend them doing nothing at all. 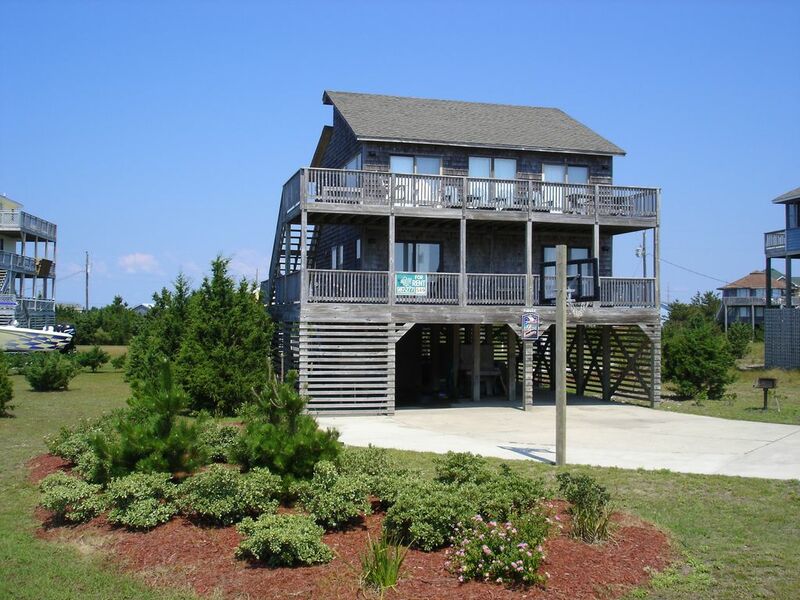 With an excellent location one lot back from the beach, a private pool, and easy walking distance to Hatteras Water Sports (on the Pamlico Sound), your options are as unlimited as your imagination. The beach activities do not have to end after dark either. Hatteras Island is one of the few places where you can build a fire on the beach at night - something the kids will always remember. The house has a great view of the ocean as well as sunset views over the sound. Located in a neighborhood with big lots leaves plenty of open space for viewing the world around you. The first floor has four bedrooms and two baths. The beds in the two main bedrooms are pillowtops - one king and one queen. Bedroom number three has two twin beds and number four has two sets of bunk beds. Each bedroom has its own TV for additional privacy when you need to retire. The deck on this floor also has a swing for relaxing. The upstairs great room is perfect for unwinding after a long day on the beach. Mix a cold beverage, turn on your ipod (bluetooth available), sit back and enjoy the commanding view of the ocean. Some of the additional amenities available to you are the private pool, a great basketball court, a six-person hot tub, and approximately 75 movies to choose from. We live in Cary, NC so we are only about three and a half hours from our house. We try to get down to Hatteras as often as possible to fish, hang in the sun or just have fun on the water. Some of the things we like best about Hatteras are the laid back surfer/fishing vibe, the great local restaurants (no chains here), access to really clean waters and the natural environment found there. If you're a bird watcher, you will especially like late fall at Pea Island. We looked for several months and found the perfect property. It's second row, so the ocean is just across the cul-de-sac. The lot is huge so we had room to add the pool and still have room to grow. And the beach itself in front of the house is one of the finest I have ever seen. Our corner lot provides really good views. We are close to everything in the tri-villages but you feel very secluded in a small, quiet neighborhood. Sheets provided and beds made. Towels are the guests' responsibility. Two dining tables plus 8 bar seats. Heat for pool is not available. Positioned out by the pool for two reasons - you can go from the pool to the hot tub easily and the stars at night from the hot tub are amazing.